The National Energy Act, 2008 (Act No. 34 of 2008), Section 7 (2) amongst other, mandates SANEDI to direct, monitor and conduct energy research and development as well as to undertake measures to promote energy efficiency throughout the South African economy. Therefore, in the context of this Act, SANEDI through one of its Portfolios, the Smart Grid programme, developed the South African Smart Grid Initiative (SASGI) and it’s supporting Work Groups. SASGI developed the Smart Grid vision for South Africa, and is presently working with industry to provide policy inputs, address the gaps in standards and in the deployment and application of technology. During the year 2012, SANEDI setup the South African Smart Grid Initiative (SASGI). This initiative was made-up of industry stakeholders within the Electricity Distribution Industry (EDI). Its main objectives amongst others, was to draw on industry expertise, developed a Smart Grid vision for the industry and create a platform for knowledge sharing. There are indications that the electricity distribution environment will significantly change over the next few years. It is widely acknowledged that United States and Europe have made progress towards grid modernizing electricity networks in the last decade specifically to address 21st century industry challenges. While there might be different drivers for grid modernization, in most parts of the world effective energy utilisation, resource optimisation, enhanced customer participation, introduction of renewable energy options, the gravitation towards electric vehicles, job creation, etc. plays a key role in the deployment of smarter electricity networks. While the electricity grid served South Africa well in many aspects, the electricity grid is ageing, outdated, and under huge capacity constraints. The South African Electricity Distribution Industry (EDI) is confronted by numerous and significant challenges that impact directly on the sustainability of the industry and the ability to provide a reliable service to electricity customers. Amongst others, there is an urgent to address maintenance backlogs, refurbishments and strengthening, unless an immediate and direct intervention is initiated, it will be very difficult for the industry to recover from its downward trajectory. Furthermore, it is important to note that the current electricity grid was not build with the 21st century grid challenges and requirements in mind. There is a massive opportunity to introduce grid modernization while addressing the infrastructure investment backlog, hence, investment in the infrastructure is required to meet the future electricity distribution requirements. South Africa is well positioned to learn from the developments in the rest of the world. Considering that South Africa does not have to undergo the full technology development cycle, it is possible to select through the required applied research and establishment of standards the most appropriate Smart Grid options for South Africa. Economically Evolved – affordable electricity system that meets growing needs of the country. Technology enabled – fit for purpose ICT, processes, sensors, systems and applications. Intelligent – from data to knowledge. Interactive – ability to monitor, control and manage using two way communications throughout the value chain. Flexible – appropriate, scalable and adaptable based on common standards. Electricity system – the complete value chain of all interconnected equipment and components from generation to end use. Sustainable – optimised and affordable from environmental and economic perspectives. 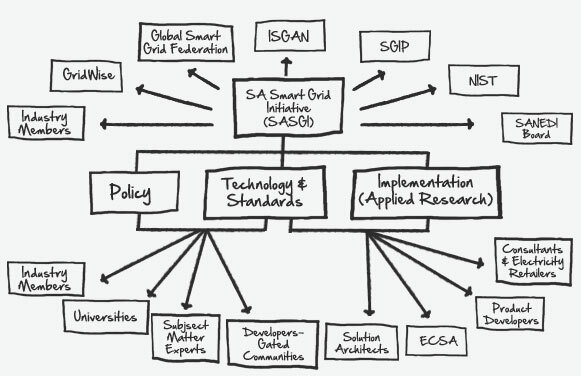 The South Africa Smart Grid Initiative (SASGI) functions as an advisory body and is also the steering committee directing the three permanent working groups as well as the ad-hoc working groups established under this institute. To engage with organised labour on a needs base. Identification and motivation of enablers to promote smart grids in South Africa. 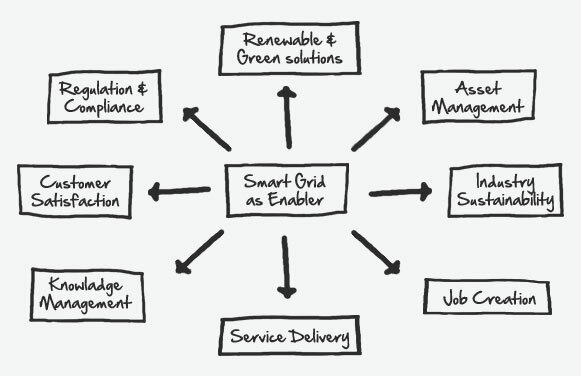 Pro-actively contribute to the policy and regulatory framework from a smart grid perspective.